I’m neither a diehard physical book fan nor a committed Kindle devotee. I read a hybrid of traditionally published texts and ebooks, depending on their content, price, their purpose, and the timescale that I have to read them. Often I will have a physical copy of a book and its ebook counterpart in the interests of tangibility and portability respectively. I say all of this to clear the ground for the plea outlined in my title above, and through the rest of this article. Most of what is shared here is subjective, and is not intended to bind the consciences of others, but simply to invite good thinking. 1. It embodies the power of good example: research has proven that when it comes to reading, the example of parents and adults is unspeakably formative in the life of a child. This is allegedly multiplied when children (especially boys) see that their Dad has an interest in books. There can be little doubt that this carries over into the example that parents can set their children in terms of reading their Bible. If our main way of encountering Scripture is vía an app on our tablet or via our Kindle, then we may be robbing our children, or the children of family members and friends, of understanding the place that the Bible has in our lives. A friend’s daughter recently saw her enjoying her daily readings and noted, as an aside, how distinctive the Bible looks. This alone sends a signal to our children, that the Bible matters to us and is read by us. This does not mean that we legalistically lumber around the house with our weighty Bible tome in the hope that someone might see us. But rather that our children can tell the difference between us browsing the BBC News and encountering the living Word of God. 2. It advertises the main reason why we are entering a church building: in some ways this is simply an echo of the point above, but with an important inflection. Many people bring their devices to church or simply use their smartphone to read the Scriptures. This has many advantages, but one major drawback is that outsiders observing us enter a church building are missing out on one very clear visual clue as to what we are doing inside the building. If people see a large number of individuals carry their Bible into a church building they will unconsciously absorb something central about what we are doing – we are meeting to read, study and apply the Scriptures together. 3. It highlights the preacher’s source of authority: as a Pastor I am absolutely against any Luddite views on where technology fits in regard to ministry. I have written here before about the huge benefit that the iPad has been to my preparation and preaching. I use the iPad in the pulpit to preach from, but I always have a Bible with me to read from and reference. For me, this is demonstrating to those who listen that this Book is central and authoritative to the task of preaching, and is separate from whatever notes I may be using. 4. It encourages a working geography of where Biblical books and passages are: one of the dangers of Bible apps is that they homogenise what every passage of Scripture looks like and where it appears on the screen. The associative learning of visually capturing how a chapter or paragraph looks on the printed page is lost in a sea of uniformly presented pages. The convenience of a Bible app is also its drawback. You can find Habakuk more quickly via YouVersion that in a paper Bible, but only if you have that app to hand. It might be argued that this is unimportant, but knowing the layout and order of Biblical books is vital and can only be acquired by using a Bible. I was brought up with endless ‘sword drills’ at children’s meetings, and while my main motivation in trying to get to a verse first was the temptingly dangled Refresher chew, the exercise did engrave a working knowledge of the Bible’s layout on my young mind. If a generation arises who have only used their phone or tablet to read the Bible then this is forever lost. 5. 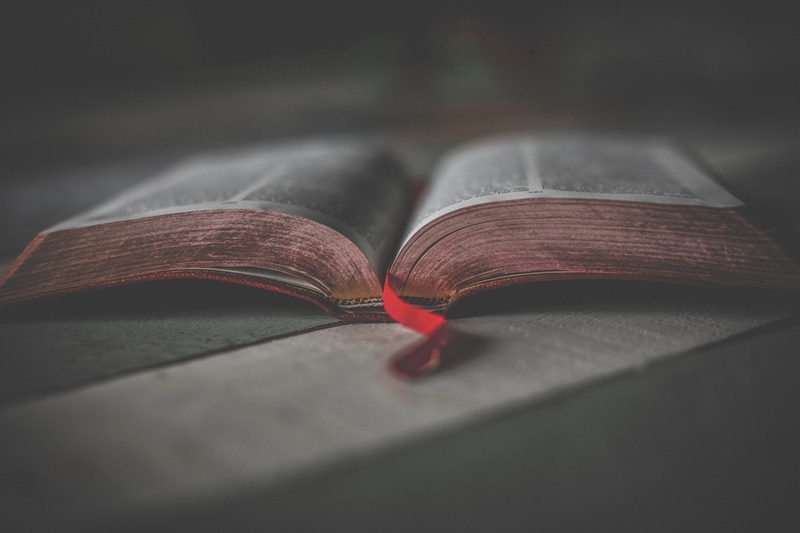 It leaves a legacy of interaction with God’s Word: some of the most valuable books I have are the Bibles of loved ones that have been passed on to me. Something about their wear and tear, their affecting little marginal notes, their interleaved notepaper where a sermon or a section of Scripture has captured their attention, gives them the feeling of gold dust. These Bibles are not mere heirlooms but a linkage back to a legacy of grace. If we don’t enjoy such a legacy we can certainly leave one for those who follow us by investing in a Bible and sticking with it, showing to later generations that we lived with and by this living Word of God. 6. It liberates us from alerts and allows us to listen: I love reading my physical Bible away from my e-reader and iPad because it gives me headspace from the mounting and incessant demands that technology makes of me day and daily. I can tremblingly leave my phone and the tweets and twitches of the online world in another room, and just listen to God. I also am not tempted to ‘flick’ to something else when my attention wanes. I am naturally distracted enough without having that mental tic automated. I could easily (and very well may!) write an article in appreciation of Bible apps, but the foregoing is a simple plea not to ditch the physical in favour of the virtual, but to see the very real benefit of keeping traditionally published Bibles as part of our libraries, our lives, and our congregational worship of God. Once again a beautifully written, clear, well reasoned and balanced offeringFor myself (and I propose that this is irrelevant to the purpose of your article) it has been such a boon to have my Kindle for reading books by godly authors and for apps for the reading and study of God’s word. I can increase font size to help my faltering eyesight – I’ve tried getting my glasses upgraded but it hasn’t worked? It always remembers what page I was on and will even sync between devices. It is so much more portable than the weighty volumes which I used to struggle with and, only having the use of the one hand I can flick the page with the deft use of my thumb. I actually like the visual that they now give us where they show the page curling over. I agree with your every comment on the plus side of using a physical, tangible book but I am thankful for what my electronic gadgets afford me and I praise God for them. A good article that I came to via the BoT website. I would respectfully push back on point 2 but the other points are great. Here’s my reason, I work with computers all day, Mon-Fri. I have a smart phone constantly on me in case there are problems with office/customers/etc. OS upgrades, app upgrades, and device upgrades give the impression of constant flux. I’ve grown tired of it all. I like the feel of a leather bound bible and the way it attaches me to a less transient rhythm. Thanks Philip. Breaking that transient rhythm is a big issue.